April 21 – Reuters (Vikram Subhedar): “The $1 trillion of financial assets that central banks in Europe and Japan have bought so far this year is the best explanation for the gains seen in global stocks and bonds despite lingering political risks, Bank of America Merrill Lynch said on Friday. From the report authored by BofA Merrill’s chief investment strategist Michael Hartnett: “The $1 trillion flow that conquers all… One flow that matters… $1 trillion of financial assets that central banks (European Central Banks & Bank of Japan) have bought year-to-date (= $3.6tn annualized = largest CB buying in past 10 years); ongoing Liquidity Supernova best explanation why global stocks & bonds both annualizing double-digit gains YTD despite Trump, Le Pen, China, macro." A strong case can be made that Q1 2017 experienced the most egregious monetary stimulus yet. No financial or economic crisis – and none for years now. Consumer inflation trends have turned upward on a global basis. Stock prices worldwide have surged higher, with U.S. and other indices running to record highs. At the same time, global bond yields remained just off historic lows. Home prices in many key global markets have spiked upward. Meanwhile, central bank balance sheets expanded at a $3.6 TN annualized pace (from BofA) over the past four months. With U.S. bond yields reversing lower of late, there’s been a fixation on weaker-than-expected Q1 U.S. GDP. Meanwhile, recent data have been stronger-than-expected in China, Europe and Japan. EM has been buoyed by strong financial inflows and a resulting loosening of financial conditions. Thus far, Fed baby-step normalization efforts have been overpowered by the “liquidity supernova”. Mr. Kuroda is quick with a smile and carries an infectious laugh; seems like a nice guy. Seeing his big grin after stating “the inflation front has not much improved, unfortunately,” I couldn’t help but think he’s not at all unhappy with inflation stuck below target. And why not? The BOJ can proceed with its historic experiment in government debt monetization, in the process administering more liquidity upon a global system already inundated with central bank “money”. The Fateful Day of Reckoning and attendant very difficult decisions – for Japan and the rest of the world – can be relegated to some future date. Historians will surely appreciate what few are willing to admit today: it’s crazy that Haruhiko Kuroda has come to wield such incredible power over global finance and securities markets. Japan and Europe confront deep structural issues. In particular, Japan faces an aging population and a conservative, high-savings society. It remains a powerful manufacturer and runs persistent Current Account surpluses. In the face of unprecedented debt monetization, the yen has proven impressively resilient. What’s more, the yen’s 7% y-t-d gain (versus $) will not be supportive of the BOJ attaining its inflation target. As for the ECB’s Draghi, it’s even more difficult to argue that low inflation remains a scourge worthy of “whatever it takes.” Yet he’s obviously in no rush to rethink his aggressive printing operations – no hurry whatsoever to face his Day of Reckoning. Here at home, inflationary biases throughout assets markets have over recent months turned increasingly robust. Stock prices surged to record highs, while home price inflation picked up steam as sales transactions escalated to the strongest pace since 2007. Debt issuance has been running at a record rate. In spite of it all, Fed chair Yellen has been quick to note that inflation remains “slightly” below the Fed’s 2% target. Rather quickly the markets question whether the Yellen Fed has the fortitude for a couple additional baby-step rate increases this year. Can we all agree that this central bank fixation on a 2% consumer price inflation target is borderline ridiculous? Consumer price dynamics have changed momentously over the past 20 years. Most importantly, the technology revolution has basically created an unlimited supply of goods and services. From smart phones and tablets to digital downloads, companies can now easily expand output to meet heightened demand. There has been as well the equally momentous move to “globalization” – with seemingly limitless cheap labor coupled with unlimited cheap finance fundamentally boosting the supply of inexpensive goods and services globally. Technological advancement has played a profound role in oil extraction, new energy technologies and energy conservation. There are as well advancements in pharmaceuticals and healthcare more generally. Even in basics like food, there is the proliferation of higher-priced organic and healthy-choice products. And somehow government economists are adept at constructing models and calculating hedonic adjustments to come to an accurate measure of true underlying CPI? And this single contrived data point has become key to policies that amount to a historic experiment in global activist monetary management? Wow. I’m reminded of the mortgage finance Bubble period with chairman Greenspan supposedly fretting that booming housing markets were impervious to Fed “tightening” measures. I recall writing in the CBB at the time, “Greenspan could easily resolve this issue with two phone calls, and they’d both be local.” Fannie and Freddie were clearly at the heart of a historic Bubble in mortgage finance. Yet no one was willing to call the Fed out on the reckless GSEs and the powerful distortions emanating from the market embracing the implied Washington backing of agency obligations. These days, virtually no one is willing to call out global central bankers on their notion that there is basically no limit to measures to be employed to achieve 2% CPI bogeys. Zero rates, negative rates, Trillions of monetization, acquire equities and corporate debt, market yield manipulation, etc. Risk be damned. Everyone is content to disregard that central banks have inflated epic Bubbles almost everywhere across virtually all asset classes – and they’re trapped. The entire contemporary notion of “inflation” is deeply flawed. Years ago, I adopted the “Austrian” view: start with the expansion of Credit – “Credit/monetary inflation” – and then diligently monitor for price effects and inflationary consequences associated with the resulting increase in purchasing power. Inflation can arise in myriad forms: rising consumer and producer prices; rising asset values and market distortions; increasing corporate profits and investment; trade and Current Account deficits; etc. And as the late Dr. Kurt Richebacher was so great at explaining, consumer prices were generally the least threatening inflationary manifestation. Central bankers could and would squeeze consumer inflation with tighter policy. Asset inflation, on the other hand, would be allowed (even nurtured) to develop into Bubbles that would inflate to the point of imparting deep structural (financial and economic) maladjustment. As we’ve witnessed for over twenty years now, there’s no constituency for thwarting rising asset prices. After experiencing the mortgage finance Bubble fiasco, it’s difficult to comprehend that global central bankers have so aggressively embraced and promoted asset inflation. Central bankers have been hoping for modest self-reinforcing inflation in a general price level. General price inflation would, so the thinking goes, spur a commensurate increase in Credit that would support ongoing moderate increases in CPI. Well, it may have worked that way in the past but no longer. Central bankers have ensured that the powerful inflationary biases reside throughout the asset markets. These days, monetary inflation works predominately to stoke asset inflation and Bubbles, with major ramifications for ongoing inequitable wealth distribution and system fragility more generally. Deep structural impairment will be revealed when the Bubble falters, a dynamic that clearly reverberates these days throughout global bond markets. During the late-nineties Bubble period, there was ruminating over federal fiscal surpluses that were expected to extinguish much of outstanding Treasury debt. It was all a Bubble mirage. Anyone contemplating a U.S. government $20 TN in the whole would have been viewed as a complete nut case. And here we are again in the heart of a historic Bubble, with Washington politicians talking about big tax cuts paid for with future revenues. The scope of prospective post-Bubble deficits is almost difficult to fathom. Sunday’s first round French election will be captivating. A Marine Le Pen versus Jean-Luc Mélenchon second round would be a big issue for the markets. Markets Friday were somewhat concerned that Le Pen could receive a boost after this week’s terrorist shooting on Paris’ Champs- Élysées. For the most part, however, players were heartened by polls showing centrist Emmanuel Macron somewhat widening his narrow lead over Le Pen. Both François Fillon and Mélenchon remain within striking distance. Crude was slammed almost 7%, as the GSCI commodities index sank 3.9% this week. And while OPEC remains an ongoing issue, China seemed to be at top of mind. It’s almost as if every headline related to tighter Chinese regulation – real estate finance, shadow-banking, wealth management products, insurance, corporate debt and repo leverage, Internet finance, the stock market – seems to help reawaken market fears of latent system fragilities. Timid policymaking has not only not worked, it’s has emboldened Bubble excess. Tough policies will be necessary but risk bursting the Bubble. It’s evolved into a global issue: There’s no cure for major asset Bubbles other than unwinds. Once asset inflation becomes the prevailing inflationary manifestation it becomes impossible to inflate away the problem. Instead, central bank efforts to spur general inflation only exacerbate Bubbles and maladjustment. That’s The Big Ugly Flaw in this runaway global monetary experiment. Back when he served as president of the Dallas Fed, Richard Fisher espoused some cogent advice for global central bankers: The law of holes – when you find yourself in a hole, first you must stop digging. Well, the problem today is that instead of heeding Fisher’s “stop digging” they came together, called in the big backhoes and have been shoveling fanatically ever since. It is testament to the achievements of central banks in fighting recession and deflation in recent years that talk has now turned to removing extraordinary stimulus rather than extending it. It was revealed this week that the Federal Reserve had begun to debate shrinking its balance sheet, which swelled massively during its programmes of quantitative easing. Meanwhile Mario Draghi, European Central Bank president, moved swiftly to quash rumours that his bank would renege on a commitment to keep deposit interest rates negative at least until it ends its own QE programme, which is planned to continue at minimum until the end of the year. Both are sensible courses of action. The Fed, already in tightening mode, can afford to start a public conversation. The ECB, at an earlier stage in the process, needs to emphasise continued stimulus. In both cases decisions must be based on judgments of the world as it currently is, not a premeditated return to a perceived normality that probably no longer exists. QE and negative interest rates were responses to highly unusual circumstances following the global financial crisis. But even now, nearly a decade later, it seems improbable that advanced economies will snap smartly back to their pre-crisis norms with policy interest rates in America and Europe up above 4 or 5 per cent. Many estimates of long-term real interest rates are very low, and there is little sign of inflationary pressure from wages even in relatively healthy economies like the US. Super-loose monetary policy and negative interest rates have created some distortions and may have contributed to rapid increases in asset prices. But that is surely preferable to re-running the experience of the 1930s, in which monetary policy was kept too tight for too long. The lesson of the past decade is that central banks should err heavily on the side of keeping monetary conditions loose. Given that part of the effect of super-easy policy works through expectations, it is also important that central banks time carefully the discussion about removing stimulus. In that context, Mr Draghi was absolutely correct to tamp down suspicions that the ECB will breach its promise of keeping rates negative until at least year-end. Making a promise to act one way for a certain length of time and then breaking that promise tends to have more severe consequences for central banks than it does in real life, or even in politics. For policymakers, building up credibility for fighting deflation is as important, if not more, than keeping inflation down. In contrast to the ECB, the Fed felt comfortable discussing at March’s open market committee meeting the prospect of beginning to reduce its giant balance sheet by the end of the year. Unlike the “taper tantrum” of 2013, which came in response to talk of the Fed reducing its asset purchases, there was little market reaction when the news broke this week. Whether to hold on to assets and how to dispose of them are tricky technical questions. What should be clear, however, is that the Fed should be in no hurry. It has no need to bow to impatience from Congress or from investors who wrongly opposed QE in the first place. Thanks to their own efforts, central banks have increasingly pleasant tasks to perform, removing emergency measures rather than trying to think of more. But in doing so they must be guided by the same dispassionate technocracy that caused them to go down that route in the first place. The precious metal is up nearly 10% this year, and it’s likely to keep climbing. For an allegedly precious metal, gold has gone without love for a long time. Trillions from global central banks have lifted many assets—from stocks and bonds to Manhattan condos—to or close to record highs, yet gold continues to slump near $1,250 a troy ounce, well off its 2011 peak near $1,900. Just when you’re ready to relegate gold to the heap of has-beens along with frankincense and myrrh, it has quietly crept up 9% this year, with the latest spurt coming Friday after President Donald Trump launched airstrikes in Syria and after March job growth proved underwhelming. And there are good reasons to believe that gold’s outlook is finally brightening. For a start, years of middling underperformance and competition from perkier stocks and bonds have taken their toll, and today gold is among the most spurned and underowned assets. A March survey of 200 global fund managers by Bank of America Merrill Lynch showed a net 8% who now say gold looks undervalued—after many years when the majority said gold was overvalued. Yet this 8% is still low enough to suggest that the case for gold isn’t yet widely embraced. Overproduction has also corrected after prices peaked in 2011, even as demand continues to grow, especially in Asia. “Consumption by Turkey, India, China, and Russia alone have exceeded global mine supply since 2013, which means that inventories of physical metal held in Western vaults are being depleted to meet demand,” says John Hathaway, co-manager of the Tocqueville Gold fund (ticker: TGLDX). Hathaway highlights two other overlooked catalysts: First, a new Shariah gold standard was approved late last year, which could spur the creation of gold exchange-traded funds for the Islamic world, home to about a quarter of the world’s population. On top of that, countries including China, Russia, Saudi Arabia, and Iran increasingly use gold as a settlement currency when trading oil and other commodities, and Beijing has made no secret of its plan to encourage wider international use of the yuan through gold convertibility, instead of relying on the U.S. dollar for trade. We know, of course, that gold is a hard-to-value commodity with no real industrial function, and its ups and downs can seem less fathomable than a teenager’s mood swings. But it often takes a cue from real interest rates, which are essentially nominal interest rates minus inflation. 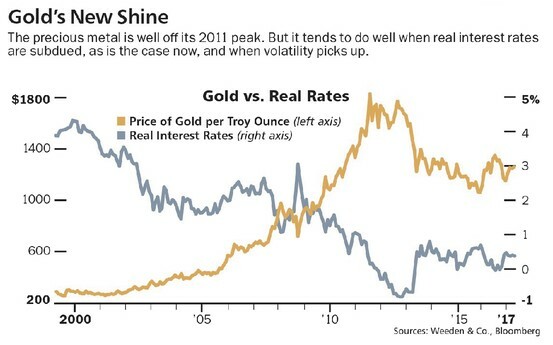 It’s no coincidence that gold’s long bull market unfurled from 1999 to 2011 against a long decline in real rates, or that gold fell in 2011 as real rates started to tick higher. It makes sense that gold thrives when real rates wilt: Robust yields on other assets make investors less keen on owning a precious metal with no industrial use. On the other hand, when real rates are low and investors are less confident in fiat currencies, the opportunity cost of holding gold declines, as well. Michael Purves, Weeden’s chief global strategist, thinks real rates will stay contained or prove weaker than investors expect, which would be a boon for gold. Our nominal interest rate, as denoted by the yield on 10-year Treasuries, initially spiked on Trump’s promise of tax cuts and fiscal spending, but it has since stalled below 2.6% and is plumbing five-month lows. Foreign buyers frustrated by lower yields overseas—10-year government bonds yield just 0.22% in Germany and 0.05% in Japan—help keep a lid on U.S. yields. At the same time, U.S. inflation readings are creeping up. Having surmounted recent resistance near $1,250, gold can quickly move up to its 2016 high near $1,375, says Purves. In the longer term, any whiff of stagflation—weak economic growth combined with inflation—could propel gold even higher. So could increased volatility from recent comatose levels. BESIDES GOLD mutual funds like Tocqueville, gold bugs have their choice of ETFs, starting with the SPDR Gold Trust LD in Your Value Your Change Short position (GLD), which tracks the performance of gold bullion. Aggressive, longer-term investors with the stomach for volatility might look to gold miners, which, through successful exploration and production, can create more value for investors independent of the base metal—one reason that gold-mining stocks tend to outperform the base metal when the gold price surges (and underperform when gold falls). In 2016, for instance, gold finished the year up 8.6%, but the VanEck Vectors Gold Miners ETF (GDX) surged 53%. So far this year, it is up 12%. The VanEck Vectors Junior Gold Miners ETF (GDXJ), which tracks smaller, riskier mining companies, is up 15%. 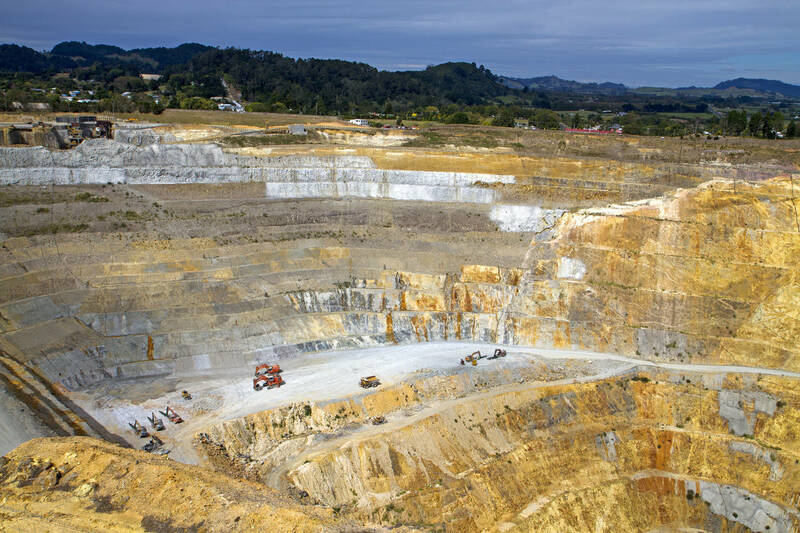 Among the bigger gold-mining stocks, Barrick Gold (ABX) began its restructuring three years ago by cutting costs and has now shifted toward improving production. In February, it reported fourth-quarter profits that beat estimates and raised both its production outlook and its dividend. Barrick is expected to focus on development projects in Nevada and Lagunas Nortes in Peru, and the improving free cash flow will help reduce debt and the need to offload noncore assets outside the U.S. The company “has been surprising to the upside, which in our view can continue and is not reflected in the numbers,” notes Credit Suisse CSGN.EB in Your Value Your Change Short position analyst Anita Soni. Shares recently traded at 1.43 times Barrick’s net asset value versus 1.56 times for its peers. Credit Suisse’s price target is $25, roughly 30% above current levels around $19. IS AMERICA’S economy booming? Consumers seem to think so. Their confidence, as measured by the Conference Board, a research group, is at its highest since December 2000, when the dotcom bubble had not fully burst. 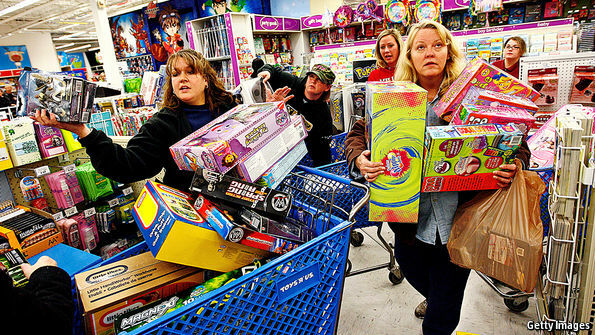 Yet in both January and February this year, personal consumption fell. The signals from firms are no less mixed. Small-business confidence is so high that relying on this alone to predict annualised GDP growth in the first quarter leads to a staggering forecast of 7.1%, according to Goldman Sachs, a bank. Order books are swelling and jobs are plentiful, firms say. Yet industrial production has been flat since December, and banks have slowed business lending dramatically. Americans seem wildly enthusiastic about the economy, but it is not clear why. 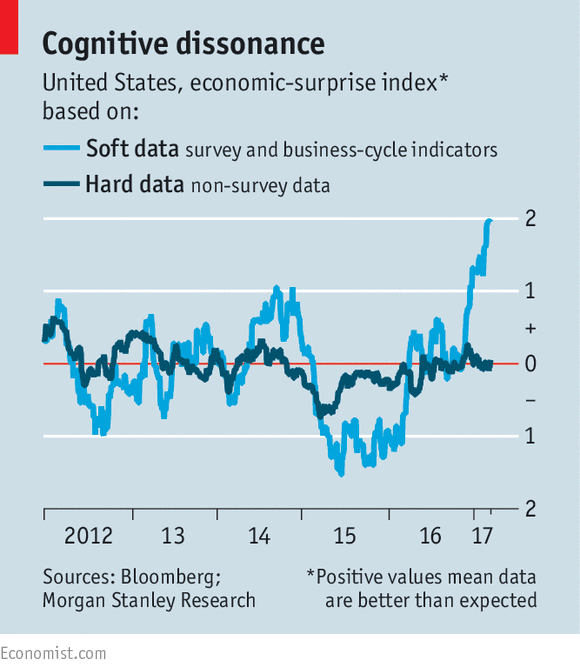 The surge in the so-called “soft” economic data, drawn from surveys, began when Donald Trump won the presidential election in November (see chart). It coincided with a boom in the stockmarket, up 10% since then, as investors began to salivate over the prospect of tax cuts and deregulation. Yet the “hard” economic data, which measure actual economic activity, have trundled along much as expected. The disparity has caused growth forecasts to fall out of sync. As The Economist went to press, a model at the Atlanta Federal Reserve put annualised growth in the year’s first quarter at 1.2%. A competing forecast at the New York Fed put the rate at 2.9%. It is tempting to discount strongly upbeat surveys as driven by politics. Owners of small businesses lean heavily Republican. Consumer confidence is up most among over-55s, who are also likely to have voted for Mr Trump. Most economists’ forecasts are closer to the number from Atlanta than the one from New York. Many of them are mindful of the fact that the economy has often seemed to sag in the first quarter of recent years. An attempt by government statisticians in 2015 to purge the growth data of seasonal factors may not have been a complete success. Most important, no tax cut or serious deregulation has happened yet. Instead the Republicans have failed to pass a promised health-care reform, which contained large tax cuts for the rich, on their first attempt. (It may soon reappear, but if it does, its passage, especially through the Senate, is far from certain.) There is reason to wonder whether the party is capable of overcoming the political squabbles that will inevitably accompany tax reform. Yet even if Mr Trump fails to overhaul the tax code completely, few doubt that Congress will pass a simple cut in rates for him to sign. And confidence in the economy may still prove self-fulfilling. Republicans have long held that replacing Barack Obama’s chilliness towards business with a warm embrace of commerce would lead to an investment boom (on this, they might cite the support of John Maynard Keynes, who wrote that businesses are “pathetically responsive to a kind word”). Although there was no sign of a recovery in investment in the fourth quarter of 2016, sales of capital goods, such as machinery, have picked up a bit this year. Whether that trend continues will reveal whether confidence is crystallising or dissipating. Some conservatives, impatient to trigger what they see as an inevitable surge in investment, want tax cuts, whenever they happen, to be backdated to the beginning of 2017. Retrospective tax changes are rarely a good idea. For the moment, Republicans should be encouraged that two sectors of the economy—housebuilding and manufacturing—have accelerated tangibly. That should please some of Mr Trump’s blue-collar supporters. In February the trade deficit, which Mr Trump views, strangely, as a barometer for economic strength, was 4.5% lower than it was a year ago. A worldwide economic acceleration has helped this trade and manufacturing revival. The dollar has fallen back almost to where it was on the eve of Mr Trump’s election, making American goods cheaper in other countries. What if the surge in confidence proves fleeting? The stockmarket would surely sink. But it is not as if America was in a funk before Mr Trump won in November. The world economy—and financial markets—have been firming up since mid-2016, partly because of fiscal stimulus in China. America’s recent growth of about 2% has been enough to eat up much of the slack in the economy, as rising inflation shows. Much more productivity-boosting business investment would certainly be welcome, not least because Americans produced barely any more per hour worked in 2016 than they did a year earlier. But Mr Trump’s promise of 3.5-4% growth has never been a realistic goal, because America’s greying workforce imposes a lower speed limit on the economy than in the past. As that becomes more apparent, the economic elation may subside. If so, those who have been sceptical about soft data as they have heated up should remember to be equally unmoved as they cool down. - Speculative gold traders pushed their net bullish position up for the fifth consecutive week. - Speculative silver traders finally cut back on net bullish positions, but silver remains at extremely bullish levels. - We believe that French presidential elections will result in an expected 2nd round run-off between the two top candidates. - Based on French elections producing the expected result, it may be a catalyst for gold traders to cut bullish positions and result in a correction in precious metals. The latest Commitment of Traders (COT) report showed yet another increase in the net speculative long position for the fifth consecutive week. Silver positions also increased on the week, though based on the silver price declining after the COT close-date, we expect that they are a bit lower than shown in this report. Of course, the big news this week are the French elections on Sunday. With no candidate expected to take the necessary 50% of the vote to win the election, it is widely expected to come to a run-off between the top two candidates: Emmanuel Macron and far-Right leader Marine Le Pen. The big wildcard is if communist candidate Jean-Luc Mélenchon, who is surging in the polls, can pull into the top two spots with Le Pen. If that happens, then a run-off between two anti-Euro candidates would ensue causing markets to significantly drop (and gold probably to rise). On another note, Russia released its monthly gold reserves and it turns out the country added a chunky 800,000 ounces during the month of March. 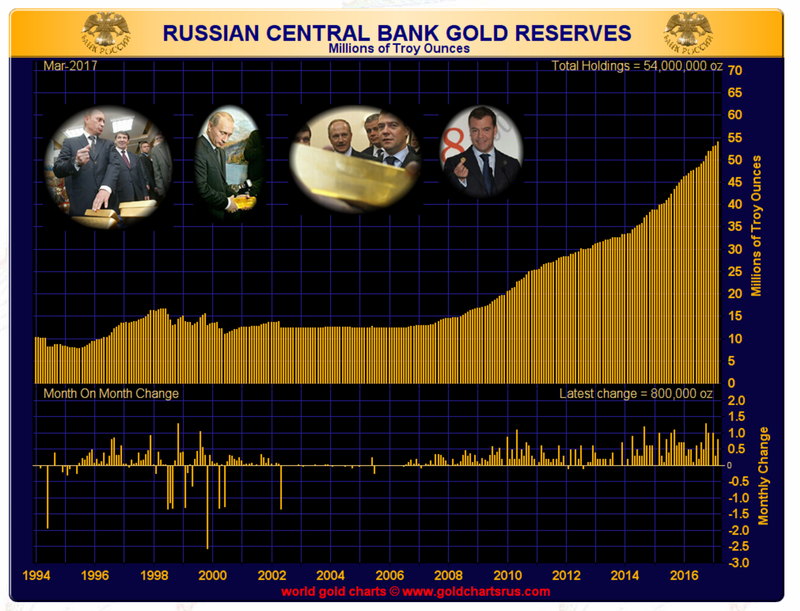 While this wasn't stunning, it does show the Russian government is still confident enough in gold (or a lack of confidence in the system) to continue to add significant amounts to reserves. 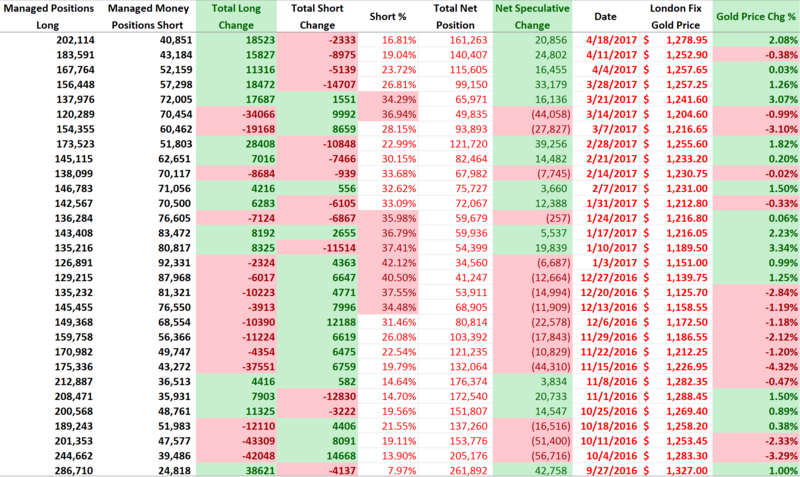 We will get more into some of these details, but before that, let us give investors a quick overview into the COT report for those who are not familiar with it. There are many ways to read the COT report, and there are many analysts that focus specifically on this report (we are not one of them), so we won't claim to be the experts on it. 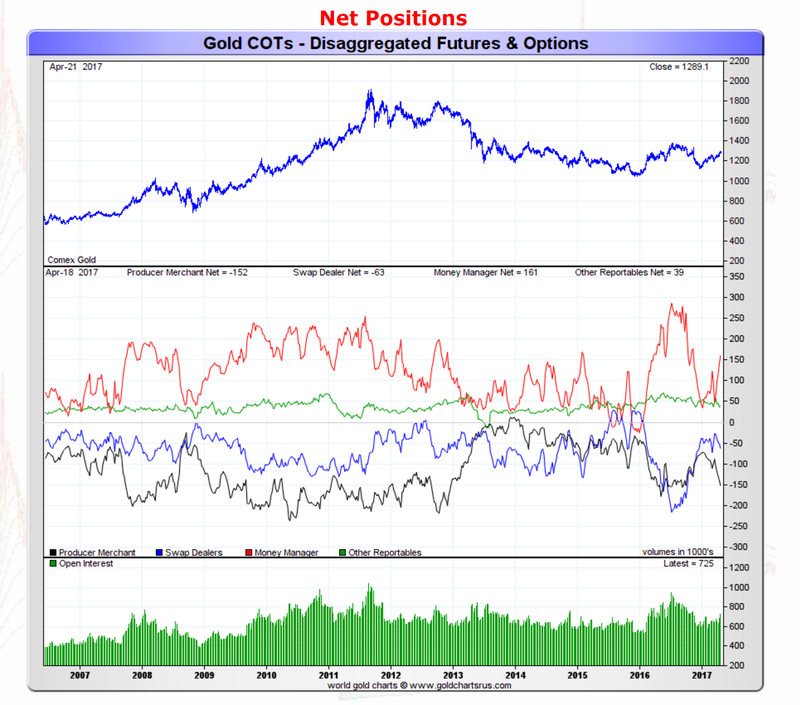 This week's report showed a fifth consecutive week of increases in speculative gold positions as longs added 18,523 contracts during the COT week while shorts decreased by 2,333 contracts. The red line represents the net speculative gold positions of money managers (the biggest category of speculative trader), and as investors can see, we saw the net position of speculative traders increase by 24,000 contracts to 140,000 net speculative long contracts. The red line, which represents the net speculative positions of money managers, showed a decrease in bullish silver speculators as their total net position fell slightly by around 2,000 contracts to a net speculative long position of 97,000 contracts. 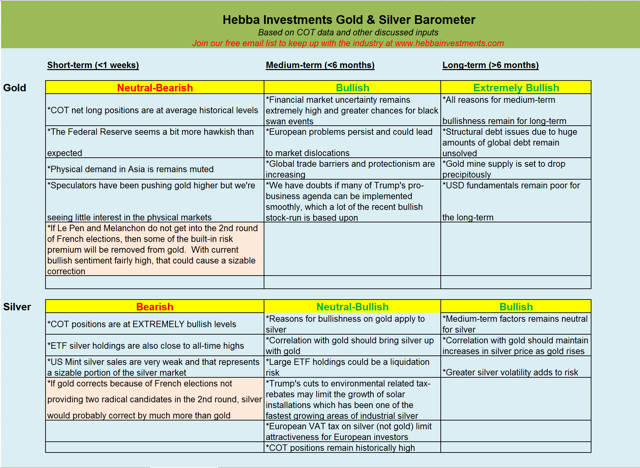 As we mentioned last week, the current speculative silver position is at extreme levels, so investors need to be extremely cautious at these price levels. Silver stood out last week with its 3% drop compared to gold essentially treading water for the week, which may mean that traders are cutting back on their speculative long positions. 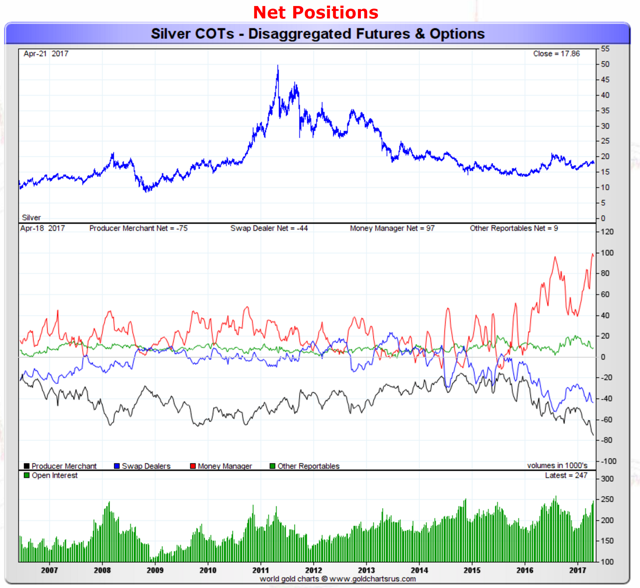 Based on these historically high silver positions, we could see this drop continue. During March, Russia added 800,000 ounces (around 25 tonnes) to its gold reserves. While not as large as its eye-popping October purchase, it still was a large purchase and shows that the Russian government is still very interested in gold at these prices. Additionally, investors tend to forget that 25 tonnes per month of gold purchases annualizes to around 10% of total world gold production. That is a big chunk of newly mined production that is going to one entity - something to keep in mind if gold production starts to drop as we believe it will in the upcoming years. Without a doubt the big short-term event for markets are the upcoming French elections on Sunday, which will give markets (at least US ones) plenty of time to digest results. Despite tight polls and the surge for communist candidate Melanchon, it looks like the primary candidates who will face off in the second presidential round will be centrist Macron versus the more nationalist Le Pen. While we have now had two exceptionally wrong "polling instances" over the past year that have at least temporarily roiled markets, we think traders are a bit too optimistic of a similar black-swan type scenario of a second-round run-off consisting of Le Pen and Melanchon. Based on currently elevated bullish speculative positioning in gold (and extremely bullish speculative position in silver), we think that any risk-on catalyst has the potential to spark a major correction in precious metals. That is why we are maintaining our short-term bearish outlook on gold and silver as we think the French elections turning into a "non-event" could lead some traders to sell gold and silver positions. 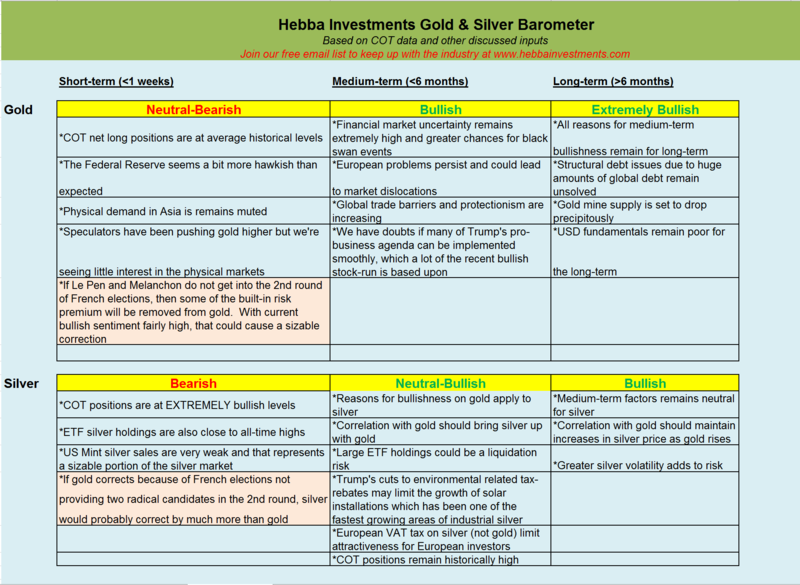 That means for short-term speculators, the strategy would be to reduce precious metals exposure in the short term by either selling gold and silver positions (SPDR Gold Trust ETF (NYSEARCA:GLD), iShares Silver Trust ETF (NYSEARCA:SLV), and ETFS Physical Swiss Gold Trust ETF (NYSEARCA:SGOL), etc). Or reducing risk by trading for less risky positions (switching miners to ETFs or from silver to gold). Of course, this is only in the short term, the medium-term to longer-term position remains very bright (and bullish) for precious metals. To most individual traders, there is no bigger buzz kill than a narrow trading range. It takes the wind out of the sails of breakout and momentum traders, and even expert stock pickers have a tough time finding the stocks which are bucking the sideways trend. Wall Street would much rather see a lively bull market when stocks are roaring and participation is widespread among all classes of investors. But sometimes even a trading range-type market is good enough for the Street , provided stock prices are near all-time highs. For even when prices are making no headway, the aggregate yield on stocks pays enough in dividends to make the lack of action worthwhile. There are indeed enough listed companies which pay a high enough dividend to make buying and holding in a lackadaisical stock market an attractive proposition. This is one reason for the torpor which currently infuses not only the financial market, but the rest of the country as well. Why worry when you can sit back and live off the interest? Widespread lethargy breeds a range-bound stock market, but it also contributes to a sluggish economy. As we'll discuss here, there is a reason for the public's lethargy and within that reason lies the solution to the problem. If you needed proof of the trading range-induced complacency out there right now, the public's response to the U.S. airstrike on Syria is a good example. While there was a modicum of shock and anger, the response to the military action was mostly lethargic. Even the stock market seemed unimpressed enough to rally, which underscores the extent of the public's complacency. Even Congress is infected with the conservation bug. Even as President Trump touts his ambitious plan to cut taxes, the U.S. House majority leader is pouring water all over that plan by saying Congress will balance any proposed tax cuts by finding ways to increase revenues (read more taxes, but in different areas). Thus the old "paying Peter by robbing Paul" syndrome has infused America's elected leaders, who seem to afraid to risk anything like general prosperity. One certainly can't fault the President for trying to break the lethargy that has dominated the economy in the last two years. His attempt at lifting the huge burdens imposed on the middle class by reforming Obamacare were spurned by Congress. His latest move appears aimed at stimulating the economy via military conflagration, a tried-and-true (short-term) economic palliative to be sure. The subdued mood of the market can only be understood in terms of the long-term economic cycle, or K-wave. This cycle is divided into four "seasons" of economic activity over a period encompassing roughly 60 years. Each season approximates to 15 years. The winter season of the cycle was between 2000-2014/15, with the last 60-year cycle bottoming at the end of 2014. We're now in the early stages of K-wave spring, which should last until about 2029/30. So if economic spring has sprung, what is keeping the economy from flourishing? The answer to that is best seen in a timely analogy. Even as the Northern hemisphere experiences the early phase of spring in April, there are still lingering signs of the previous winter. While most days are fairly warm, temperatures can still be sometimes chilly and even winter-like. It takes a while for a new season to fully establish itself while the vestiges of the preceding season gradually fade away. In like manner, it will probably take a few years for K-wave spring to become established -- especially given the severity of the K-wave winter season a few years ago. The question everyone is concerned with is what will it take to finally break the psychological shackles which have held back profligate spending and retail-level investing? The answer to that question can be found in the previous paragraph: the immutable laws of the economic K-wave will eventually lay the foundation for a fundamental change in mass psychology. At some point in the current K-wave spring season the zeitgeist of contraction and fiscal restraint will give way to expansion and liberality. Until then, expect to see occasional flare-ups of the winter mentality that predominated in the last decade. These flare-ups should become more and more infrequent, however, as the K-wave spring season gradually warms the blood and increases the animal spirits. When K-wave spring finally hits full bloom, it will bring many economic benefits. There will be a few signs to watch for to let us know that spring has fully arrived. First and foremost, watch for higher yields on U.S. Treasury bonds. There is no surer sign that the long-term economic cycle is accelerating than rising bond yields. As the new K-wave upward phase progresses we'll also see increasing real estate activity as prospective homebuyers and commercial builders alike look to lock in still-attractive mortgage rates before they get too high. As real estate timer Robert Campbell addressed in his latest newsletter (www.RealEstateTiming.com), U.S. home prices have broken out of a two-year doldrums phase and are rising at their fastest pace since 2014. The momentum of real estate activity is on the upswing. Finally, look for speculative interest in both stocks and commodities to increase on a large scale. Risk aversion is a lingering symptom of the contractionist psychology of the K-wave winter season. When K-wave spring blooms in full, however, investment activity will pick up as participants shed their anxieties and trade them in for a more optimistic Outlook. CAMBRIDGE – After nine dreary years of downgrading their GDP forecasts, macroeconomic policymakers around the world are shaking their heads in disbelief: Despite a populist-propelled wave of political tumult, global growth is actually set to outperform expectations in 2017. The broad story behind the global reflation is easy enough to understand. Deep, systemic financial crises lead to deep, prolonged recessions. As Carmen Reinhart and I predicted a decade ago (and as numerous other scholars have since corroborated using our data), periods of 6-8 years of very slow growth are not at all unusual in such circumstances. True, many problems remain, including weak banks in Europe, over-leveraged local governments in China, and needlessly complicated financial regulation in the United States. Nonetheless, the seeds of a sustained period of more solid growth have been planted. But will the populist tide surging across the advanced economies drown the accelerating recovery? Or will the recovery stifle leaders who confidently espouse seductively simple solutions to genuinely complex problems? It is hard to overstate how much rides on the Sino-US relationship, and how damaging it would be if the two sides could not find a way to work together constructively. The Trump administration believes that it has the bargaining tools to recalibrate the relationship to America’s advantage, including a tariff on Chinese imports or even selectively defaulting on the more than $1 trillion the US owes to China. But a tariff would eventually be overturned by the World Trade Organization, and a default on US debt would be even more reckless. French Presidential candidate Marine Le Pen wants to kill off the EU because, she says, “the people of Europe do not want it anymore.” And while opinion polls have the pro-EU Emmanuel Macron beating Le Pen decisively in the election’s second-round runoff on May 7, it is hard to be confident in the outcome of a two-person race, especially given Russian President Vladimir Putin’s support for Le Pen. Given the unpredictability of an angry electorate, and Russia’s proven capacity to manipulate news and social media, it would be folly to think that Macron is a lock. Italy’s election is not for another year, but the situation is even worse. There, populist candidate Beppe Grillo is leading polls and is expected to pull in about a third of the popular vote. Like Le Pen, Grillo wants to pull the plug on the euro. And, while it is hard to imagine a more chaotic event for the global economy, it is also hard to know the way forward for Italy, where per capita income has actually fallen slightly during the euro era. With flat population growth and swelling debt (over 140% of GDP), Italy’s economic prospects appear bleak. Though most economists still think exiting the euro would be profoundly self-destructive, a growing number have come to believe that the euro will never work for Italy, and that the sooner it leaves the better.